This are encompasses about 3,600 acres. This is a very good area for bird watching, especially shorebirds. Saltwater fishing and waterfowl hunting is allowed here. There is a public access boat ramp located on Faunce Landing Road in Absecon. For more information visit this NJ Division of Fish & Wildlife website. Located in Northfield, this municipal park has an exercise trail and 5 miles of hiking trails. This park also contains a live animal display, seasonal food stand, and many ponds that are stocked with trout (fishing with a license). For more information visit the Birch Grove Park website. This tract of federal land is over 20,000 acres of wetlands and forest. It is located in the area of Oceanville, and partly in the Barnegat area. There is an eight mile driving loop for nature observation, which can be walked or biked. There are also two short hiking trails and a Visitor's Center. This is a good area to look for bald eagles, waterfowl, snow geese, and owls. There is an entrance fee, please call (609) 652-1665 for details or for more information visit this US Fish and Wildlife Service website. This municipal park located in Somers Point in an excellent picnic spot and bayfront beach area. A boat launch is available. Located east of Tuckahoe, this is the oldest WMA in the state, started in 1933. It is about 12,377 acres and has uplands, marsh, and six lakes. Available are hunting, fishing, trapping, boating, and bird watching. For more information call (609) 628-2103 or visit this NJ Division of Fish & Wildlife website. This area is state owned and is home to 10,000 acres of Pine Barrens including a 300-acre lake. Located off Weymouth Road in Hamilton Township. Makepeace Lake was formed by damming and flooding the old Bozarth cranberry bogs in the 1930s. For more information visit this NJ Division of Fish & Wildlife website. This area is about 14,000 acres and includes upland game hunting and waterfowl hunting, and fishing. Bird watching and biking are also allowed. For more information visit this NJ Division of Fish & Wildlife website. This is state owned, and three fourths of the 755 acres is salt marsh. 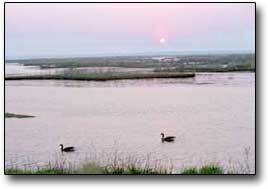 You can hike, fish, bird watch, and hunt here.For more information visit this NJ Division of Fish & Wildlife website. This is a large tract of land (about 110,000 acres) located in Atlantic, Burlington, and Camden Counties. Available are camping sites, four canoeing rivers, 40 miles of hiking, and Historic Batsto village.For more information call (609) 561-0024 or visit this NJ Division of Parks and Forestry website.